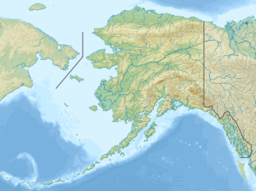 Mount Spurr, the highest volcano of the Aleutian arc, is a large lava dome constructed at the center of a roughly 5 km-wide horseshoe-shaped caldera that is open to the south. The volcano lies 80.87 miles west of Anchorage and NE of Chakachamna Lake. The caldera was formed by a late-Pleistocene or early Holocene debris avalanche and associated pyroclastic flows that destroyed an ancestral Spurr volcano. The debris avalanche traveled more than 15.5 miles to the SE, and the resulting deposit contains blocks as large as 100m in diameter. Several ice-carved post-caldera domes lie in the caldera. Present Mt. Spurr is the highest of the post-caldera. This regrown summit peak of Spurr experienced a heating event in 2004 which created a small crater lake. By 2008, the summit crater had cooled enough to have begun to have accumulated significant amounts of snow again. The youngest post-caldera dome, Crater Peak (2309m, 7575 ft), formed at the breached southern end of the caldera about 3.2 km south of Spurr, has been the source of about 40 identified Holocene tephra layers. Spurr's two historical eruptions, from Crater Peak in 1953 and 1992, deposited ash on the city of Anchorage. Crater Peak has a summit crater that is itself slightly breached along the south rim; the north wall of the crater exposes the truncated remains of an older dome or lava lake. Before the 1992 eruption, a small crater lake occupied the bottom of Crater Peak's crater. On July 26, 2004, the AVO raised the "Color Concern Code" at Spurr from green to yellow due to an increasing number of earthquakes. Earthquakes beneath a volcano may indicate the movement of magma preceding a volcanic eruption, but the earthquakes might also die out without an eruption. In the first week of August 2004, the AVO reported the presence of a collapse pit, filled with water forming a new crater lake, in the ice and snow cover on the summit. This is a third volcano occurred in this pit may have been caused by an increase in heat flow through the summit lava dome. Eruption column from Crater Peak vent in 1992. ^ a b c "Mount Spurr". Bivouac.com. Retrieved 2008-09-20. ^ a b c "Mount Spurr". Alaska Volcano Observatory. Retrieved 2018-03-06. ^ "Mount Spurr". Geographic Names Information System. United States Geological Survey. Retrieved 2018-03-06. ^ Kari, James. 2007. Dena'ina Topical Dictionary. Fairbanks: Alaska Native Language Center. ^ Boeing Company. "Volcanic Ash Avoidance". Retrieved 2013-06-13. ^ "Spurr". Global Volcanism Program. Smithsonian Institution. Retrieved 2018-03-06. Wikimedia Commons has media related to Mount Spurr.